Step 1 Heat the oven to 350 degrees, and heat a grill pan over medium-high heat until hot. Step 2 In a mixing bowl, combine the yogurt, shallot, garlic, mint, one-fourth cup olive oil, 3 tablespoons red wine vinegar, one-fourth teaspoon salt and one-fourth teaspoon pepper. Adjust the vinegar, salt and pepper to taste. This makes about 1 1/2 cups dressing, more than is needed for the remainder of this recipe. The dressing will keep for up to 3 days; keep covered and refrigerated until ready to use. Step 3Place the hazelnuts on a jellyroll pan and toast in the oven until fragrant and golden, about 8 to 10 minutes. Transfer the hazelnuts to a clean, damp kitchen towel and rub to remove the skins. Roughly chop and set aside. Step 4Place the greens in a bowl and lightly coat with the remaining 3 tablespoons olive oil. Lightly season with a pinch each of salt and pepper. Splash with a little cold water to help create steam on the grill. Place the greens on the hottest part of the grill until it slightly chars, 1 to 2 minutes depending on the temperature of the grill. Start to move the greens around to avoid burning and continue wilting for another minute or so. They should be slightly charred around the edges and nicely softened in the center. Remove the greens to a large bowl and toss with enough dressing to lightly coat. Divide the salad among 4 serving plates, and divide the hazelnuts among the servings, sprinkling them over each salad. Serve immediately. In Recipes-list.com we have selected the most viewed recipes from category - Salads Vegetarian . Enjoy the best recipes specially selected for you! 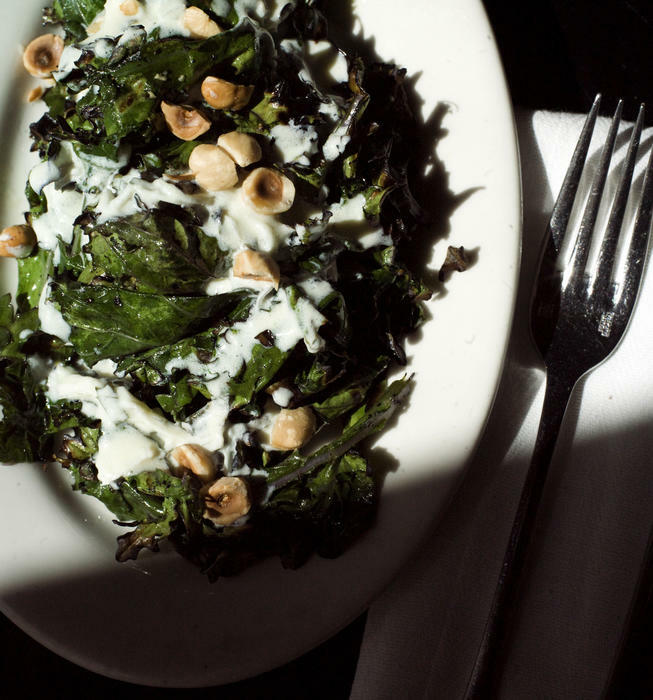 Grilled Russian kale with yogurt dressing and toasted hazelnuts is the right choice that will satisfy all your claims.